If I were the owner of a beloved franchise of films and wanted to expand that franchise into videogames, there are very few companies whom I would trust to do a license justice. And if comedy is a major component of the formula that makes fans of my properties, the list narrows to just one: Telltale Games. That's because Telltale seems to care about the licenses for which they publish games beyond the scope of their own titles and, for my money, there's nobody funnier in the industry right now. 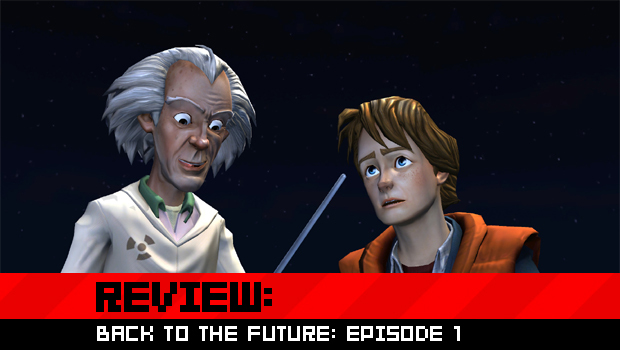 Back to the Future: The Game is, as of this first episode, a prime example of why I would place such trust in them. It is sharp, funny, and expertly designed, and it ranks among the best titles the studio has developed to date. The game begins in May of 1986, some seven months following Marty McFly's temporal adventures. Doc Brown is presumably traveling through time and, as would befit his absent-minded nature, owes a considerable amount to the bank, which has foreclosed on his property and is holding an estate sale. The sale is, to Marty's dismay, being managed by his father, George. As is so often the case, the beginning sequence uses this bit of exposition to serve as a tutorial before moving on to the meat of the game. 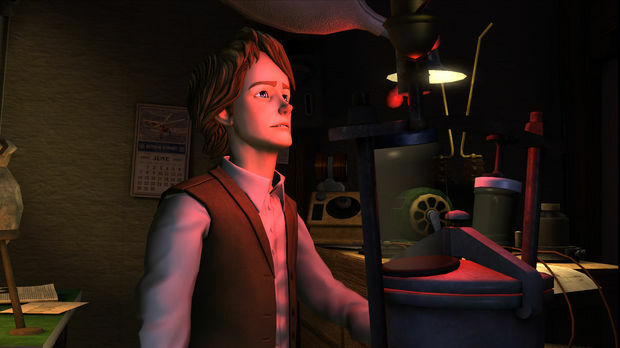 Telltale is never satisfied with their control methods, and Back to the Future uses a further refinement of the tools seen in Tales of Monkey Island, with options to move the character with cursor keys or click-and-drag with the mouse. I can't put my finger on exactly why the mouse controls feel so much better than they have in other Telltale games, but they are just about perfect. They work so effectively that I barely missed being able to use a controller, which Back to the Future does not support as an option in the PC release I played. It's a pity that controllers aren't available, but the few people for whom that might be of concern should have no trouble. Before long, it is revealed that Doc Brown has become trapped in time: a DeLorean appears outside his garage, and Marty's quest is to find and rescue him. This eventually results in Marty meeting (and manipulating) a young Emmett Brown who has yet to fully set himself upon the path of science. Marty also encounters his grandfather who, of course, is held firmly under the thumb of yet another member of the Tannen line. Similarly, the game's locations are largely safe bets. Half of the game takes place in the town of Hill Valley, for example, and while the time period may be new to fans, it's totally consistent with what you would expect of Hill Valley in the 1930s. Even new additions aren't really all that new. Early on, we're introduced to Edna Strickland, the sister of Marty (and George) McFly's disciplinarian vice-principal seen in the films. Apart from profession and gender, there really isn't anything that differentiates her character from that of her brother's, making her just as much of an analog as the generations of McFlys and Tannens we've seen before. 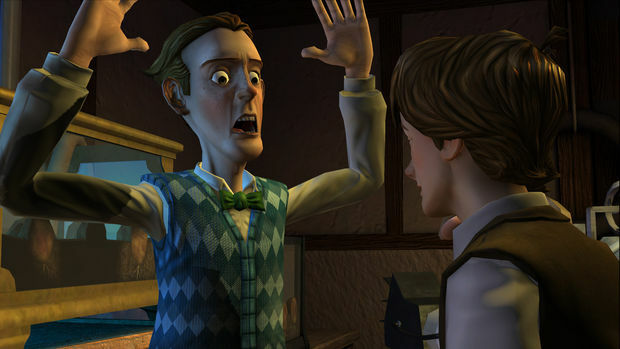 As is often the case with the puzzles in Telltale games, there is a fair bit of repetition. Certain solutions will appear as many as three times during the course of the game, albeit with variable participants or circumstances. Solutions to puzzles are also very straightforward and easy to divine, with issues typically falling on not having seen a necessary item in the environment more than not knowing how to solve a particular problem. As a result, there are very few "Eureka!" moments, but far more instances in which the first thing you think to try -- the thing that makes the absolute most sense in a rational world while still being creative -- actually works. All of this is to say that if I have to criticize something about Back to the Future: The Game, it's that it plays things very safe. No boundaries are pushed, and there's nothing original at play. Everything falls neatly within the canon without expanding it too considerably or taking it in any unusual directions. 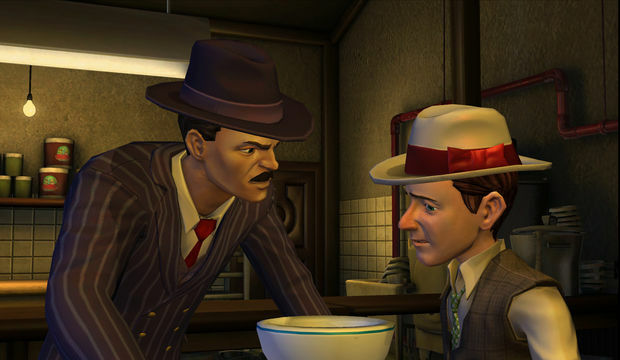 Similarly, it does not break any conventions of the modern point-and-click adventure game. In my opinion, it's exactly the right way to approach the start of an episodic series for this license. It's comfortable, safe and fun. By never attempting to be anything but a game which plays out like a Back to the Future story, it succeeds tremendously. The voice-acting in particular is very good, though it is not without some irony that the least convincing actor in the game is the only one to have appeared in the films. Christopher Lloyd sounds... well, he sounds 25 years older than he did in Back to the Future. The hallmarks of the character are there, but sadly, some of the energy simply isn't. At the same time, when your hand-selected replacements are able to do the job as effectively as or better than the genuine article you have, you're definitely doing something right. The success of the series as a whole can still be very much in doubt. Writing a good story is hard enough, but writing a good time-travel story (judging by the percentages) seems nearly impossible. And then taking that story and coupling it with inventive puzzles? It's a tall order, indeed. Telltale is off to a good start in this first episode. and if they can remain consistent with the quality without giving the feeling that they've simply produced the same small game five times, I feel comfortable suggesting that Back to the Future could be their very best effort yet.